Freezing rain, ice, snow and deicers, as well as freeze/thaw temperature cycles have the potential to wreak havoc on concrete surfaces if left unchecked. Precautionary measures such as repairing and sealing cracks and damaged concrete surfaces are cost-effective solutions homeowners can do themselves to prevent expensive replacement projects in the future. Sealers, such as QUIKRETE Acrylic Concrete Cure & Seal - Satin Finish, offer a highly water resistant coating that protects the surface from cold weather freeze and thaw cycles — a common cause of surface cracking and spalling over time. Click here for more project ideas and step-by-step instructions. Damaged mortar can be unsightly. Minor cosmetic repairs to mortar can be made on any type of brick walls, and making such repairs is easier than many homeowners realize – all you need is a caulk gun and the right repair material. A sanded acrylic mortar repair caulk - such as QUIKRETE Mortar Repair – will give the appearance of mortar in texture and color and is a more easily undertaken project for homeowners who are nervous about mixing mortar. The caulk's sanded acrylic formula adheres to brick, block, stone and concrete surfaces, and the caulk tube's square applicator tip is designed to smooth mortar joints during application of the caulk. Before applying, make sure joints are clean, dry and free of grease, dust or loose particles, and remove all loose mortar from the joint. Apply the caulk by pushing the cartridge tip over the surface and forcing a bead of caulking into the opening. Do not apply any thicker than 3/8 inch in one application. Excess caulk can be wiped off with a damp cloth. Q&A: How can I color my concrete wall? My in ground pool is close to the house foundation along one side of the pool. The foundation is swirled gray concrete, and the "view" of the wall when we are in the pool is unsightly. What product can I use to color the wall (preferably blue)? Exterior coatings near a pool need to be more durable than conventional paints. We generally recommend a permanent, cementitious coating. We would recommend using QUIKRETE QUIKWALL Surface Bonding Cement with the addition of QUIKRETE Liquid Cement Colors (brown to red) or Liquid Stucco & Mortar Colors, which includes 20 pastel colors from champagne to mocha & charcoal. If blue is a must-have, we recommend one of the professional grade QUIKRETE Coatings. Whether you use a coating or QUIKWALL, the existing wall should first be pressure washed with a 3500 psi pressure washer to remove all loose material, dirt and paint. 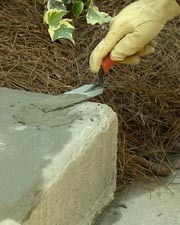 It is best to prepare the surface and apply a small trial patch of the new coating to assure satisfaction. Also note that color will appear different wet vs. dry, and vary with sun and shade and nearby reflective surfaces during the day. The most suitable decorative coating for harsh environments is QUIKRETE Epoxy Garage Floor Coating. This two-part epoxy product is designed to withstand the rigors of garage use and beyond, and is available in several shades of blue special ordered from leading home improvement stores. While designed for horizontal surfaces, QUIKRETE Epoxy Garage Floor Coating has been shown to withstand the rigors of vertical applications. 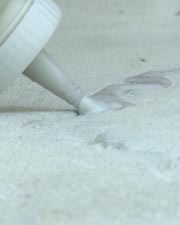 Click here for more information on detailed surface preparation and application instructions. QUIKRETE has launched 17 new how-to videos designed to make users feel comfortable tackling concrete projects. The videos are now available on QUIKRETE.com. 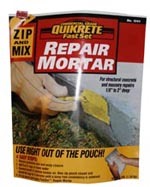 QUIKRETE Zip & Mix Repair Mortar is a multi-purpose repair mortar uniquely packaged to allow the product to be mixed in its pouch, eliminating the need for a pail. The fast-setting, polymer modified repair mortar is specifically formulated to make structural repairs to any concrete, masonry or stucco surface. To mix, unzip the enclosure and break through the protective seal. Then, add 10 ounces (or 1 1/4 cup) of water to the mortar, remove excess air from the package and knead thoroughly. 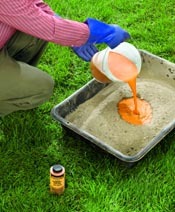 Once mixed, unzip the pouch and apply the repair material with a putty knife or a mortaring trowel. QUIKRETE Zip & Mix Repair Mortar does not require any bonding adhesive and can be applied to structurally sound concrete that has been dampened. 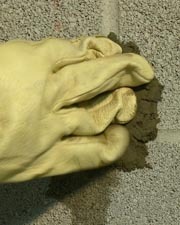 The mortar's unique properties allow the material to be sculpted during application. With 20 minutes of working time, the repair mortar is ideal for vertical or horizontal repairs ranging from feather edge to two inches deep, including concrete cracks, curbs, sewers, retaining walls, decorative moldings, bridge columns and other industrial applications. QUIKRETE Zip & Mix Repair Mortar will achieve 4,500 psi.